Looking for a challenge? We’ve rounded up some of Southwest Florida’s toughest golf holes for a course only the most battle tested would play. Enjoy. 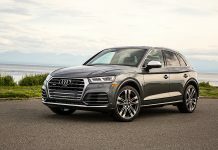 A certified Audubon International Silver Signature Sanctuary, Old Corkscrew offers a glimpse of Florida’s outback while taking in a round—just don’t be surprised if alligators, osprey, or deer play through. For a true test of skill, try a round at Old Corkscrew Golf Club in nearby Estero. The Jack Nicklaus-designed course is a master’s course in merging natural terrain into the layout of a golf course, with wetlands, scrub trees, water, and waste bunkers all playing into the shot. This is a difficult course; slope refers to the difficulty rating for a course based on scratch and bogey golfers, 113 is an average course, while 155, the maximum number, is very difficult. Old Corkscrew’s peak slope, 153 on the black, unabashedly scratches at that upper level. For our hole of choice, you’ll need a steady putter. Watch your stroke on 14, the plateau green has developed a reputation for being a round buster—if you’re too strong, that ball will sail right off the back and find itself a good 20 or so feet below the pin in a collection area. Formerly a private club, TPC Treviso Bay shares a border with Rookery Bay National Estuarine Reserve and its 110,000 acres of pristine Southwest Florida wilderness. Turned public in 2011, the layout of TPC Treviso Bay took its cues from a collaboration between Arthur Hills and Hal Sutton, giving this course a 7,367-yard map that is big on water. 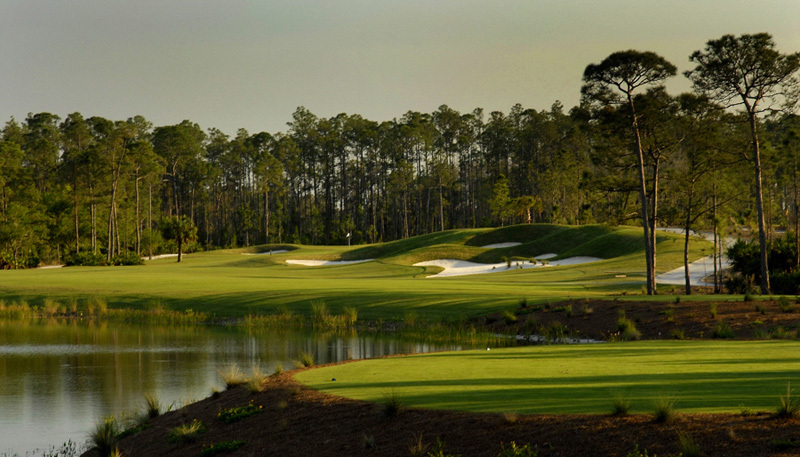 A tournament-style course, TPC played host to the Champions Tour’s 2009 ACE Group Classic. 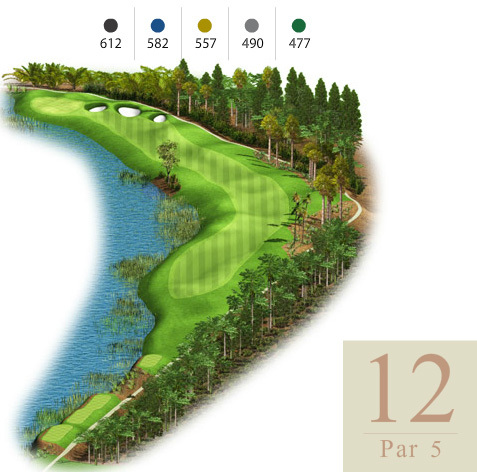 Making our list for toughest hole to play has to be the long par 5, no, 12—its 612 yards from the blacks. Dubbed the “Long Way Home” by the folks at TPC, water plays hazard along the left, with Rookery Bay taking up real estate on the right, your drive has to play it straight to make for manageable second shot—playing it short on the tee is not a bad idea. The hole breaks left, with the greens essentially forming a peninsula in the drink and deep bunker protecting its right flank, so conservative is the name of this game. 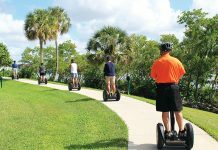 Naples Grande Golf Club’s resort course, managed by the folks at the Waldorf Astoria Naples, is at one with nature. 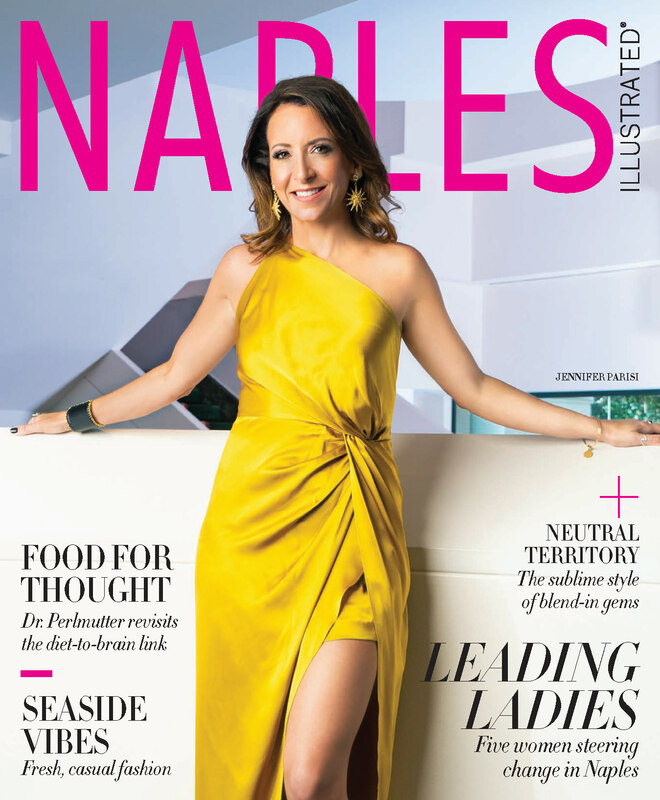 The Rees Jones design meanders through pine and cypress forest without the sight of condo or home to break the lines—a rarity in Southwest Florida. Host to the EMC Golf Skills Challenge in the early 2000s, the par 72 championship course can offer some tricky play for golfers of all handicaps. Water plays a big part in this course, five major hazards in fact, but the trouble doesn’t really begin until the later holes—consider the first five of the course a nice warm-up. No. 16, a stretching par 5 (534 from the champion blacks) runs along a long lake (30 acres to be exact) and waste bunker, making tee shots a little precarious, it’s those second shots that are pesky. Naples Grande’s style makes for difficult approach shots—the speed of the greens, hazard placement, and the unassuming slop of the course make errant shots a nightmare. And 16’s green is a beauty: perched atop a rocky outcrop in the water, if you overshoot, goodbye. And the undulating nature of the greens, paired with some steep approaches and a bunker, this is not only a beautiful looking hole, but super difficult too. The Ritz-Carlton Golf Resort is home to two 18-hole courses, the Black and Gold, the Tiburón golf club plays host to both the PGA Tour’s Franklin Templeton Shootout and the LPGA CME Group Tour Championship, making it one of Naples’ toughest, most thrilling duo courses. 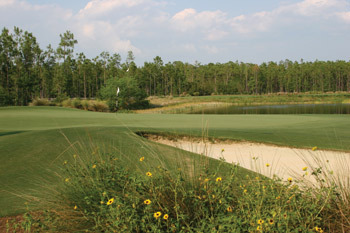 Designed by golfing legend Greg Norman, the course features some interesting aspects, including stacked-sod bunker walls and coquina shell bunkers (small shell versus soft sand), while maintaining a trueness to the course that merges the natural expanse into the course design—after all it is a Certified Audubon Cooperative Sanctuary (this is a golfers and birders dream course). For our hole of choice, we’re looking to the Gold Course and all its 7,288 yards from the tournament tees. While the course plays long, the par 3, no. 16 has the ability to break the round for anyone—including the pros from the LPGA, who had trouble with it at the CME Group Tour Championship. At just 205 from the Champion tees, its not the distance that plays menace, but the greens: undulating greens and greenside bunkers will make any misplayed shot a nightmare. Pair that with water on the front right, accuracy is key off the tee. 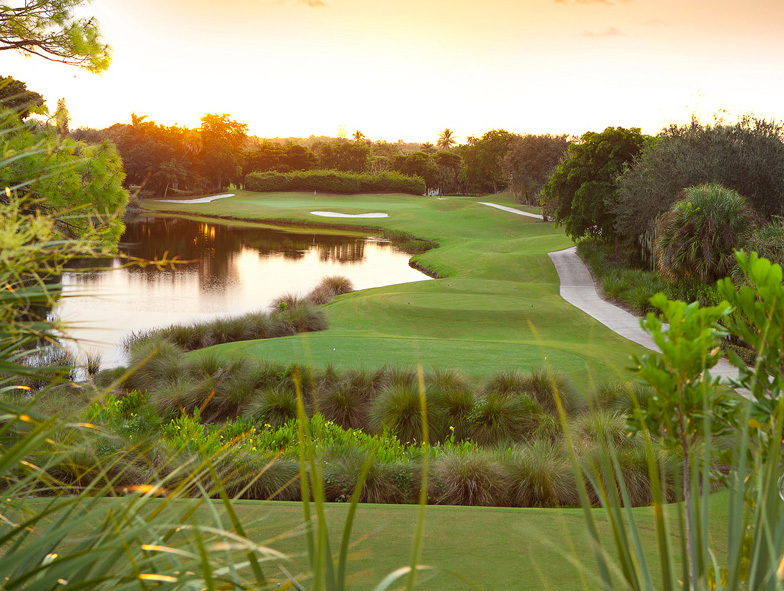 Another Nicklaus-designed course, TwinEagles’ Talon course has played host to the ACE Group Classic and the Naples’ Champions Tour. Holding all the Nicklaus hallmarks, the Talon features plenty of length, tricky approaches, and some pretty slippery greens. At 7,193 yards, if your driver game is on par, approaches are eased; if not, water and bunkers will offer quite a scare. As for our hole of choice, no. 18, a par 4, 457 yard beauty can make or break that scorecard. Bunkers line the first third, followed by water hanging to the right all the way to the green. If you overshoot, bunkers will eat your lunch, yet the greens will make those layup, safe shots a chore. It’s a great way to end a round. The resort golf course at La Playa Beach and Golf Resort ranks as one of Naples’ finest. A link-style course and home to the Leadbetter Golf Academy, the course went under the knife in 1998 with a complete redesign by architect Robert Cupp. The result: an undulating, dune-filled course that has ample of fairway to play and bunkers to make you second guess that shot. At 6,907 yards, the course plays fast and sometimes loose. More than half of the course is influenced by water—14 holes to be exact—which makes this course an “every-club-in-the-bag” type of place. La Playa’s signature hole, no. 12, is our golf hole of choice for this piece. The short par 3 (133 from champions) carries over a natural area to postage stamp-sized greens, which are devilish. Ridges bisect the greens, hiding the back half from sight, while leading to a waste bunker to the right. Simply put, the dance floor is slippery, with movement all around—more often than not, its tee, chip, putt (and maybe another putt). 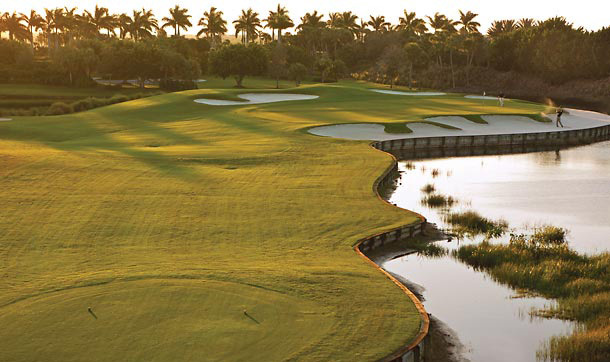 For the dedicated golfer, Lely Resort Golf & Country Club is like Valhalla. Boasting 54 championship holes on three courses, each meticulously designed by a different architect, there is a test for just about any handicap. While the Classics, the 6,724-yard Gary Player-designed course, and Mustang, Lee Trevino’s 7,217-yard beauty, each offer their unique charm and challenge, it’s Flamingo Island we’ve trained our eye on. Rated a “Top 50 Resort Course” by Golf World Magazine and earning four stars from Golf Magazine, the 7,171-yard Flamingo Island course has long been touted as one of the country’s top public courses. Designed by legendary golf course architect, Robert Trent Jones, Sr., the course merges with Southwest Florida’s natural beauty, tweaking and sculpting the landscape here and there to offer variation, elevation, and undulation. Paired with deep white sand bunkers, tight hourglass fairways (they’re narrow folks), and plenty of water, errant shots become a concern in a hurry—this course will offer a tougher go than the club’s other public course, The Mustang. The highlight of the course is hole no. 5—a 200-yard par 3 island where rolling a fairway and bunkers act as the undulating greens only friends. And about those greens: I’m petty sure they’re fertilized with Crisco; they are lightning quick. 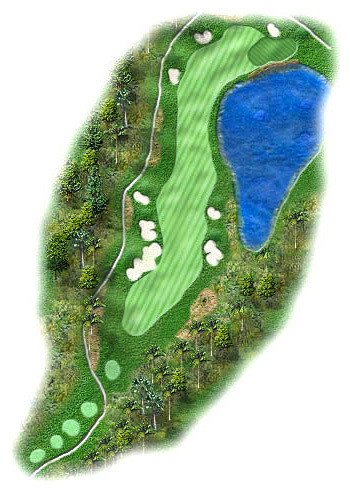 Added Lely Fun: the 9th and 18th holes share a green, making for a pretty strategic approach (i.e., watch your aim!). The Rookery at Marco, one of two resort courses at Marco Island Marriott Beach Resort, Golf Club & Spa has one of the area’s more interesting layouts. Situated in shallow wetlands a mere jump and skip from the resort’s property, the course doubles as—you guessed it—a rookery for many native and visiting birds. Wildlife plays through here, with a myriad of avian species like bald eagles, herons, and innumerable wading birds finding the course just the right type of terrain, so mush so that the course is part of the Audubon Cooperative Sanctuary Program for Golf Courses—a day on the links doubles as a day in nature. Playing at more than 7,100 yards, the course boasts five tee boxes to offer some challenge, though the course won’t have you tearing out your hair (until the end). Designed by Robert Cupp, Jr., the course features water to spare; reason enough to pack that extra sleeve of balls. But it’s on that final three-hole stretch that will either have you bellying up to the Rookery Grill bar for a celebratory drink, or to drown your sorrows. The par 3, no. 16 (169 yards from the blacks) and par 4, no. 14 (393-yard), come complete with long stretches of water and bunkers galore, setting up one of the toughest finishing holes in the area. No. 18 is dominated by water, taking up the entirety of the right side (for me, that’s a death knell). At 445 yards from the blacks, it’s a hefty par 4 that narrows down to one of the smallest greens of the course that are as quick as they are diminutive. Build your confidence through the first 17; you’ll need it for 18. To be the self-described “Golf Capital of the World,” where manicured courses are as much as part of the local scenery as the wetland marshes and pine trees—often the three are one in the same—a great public course is a must. 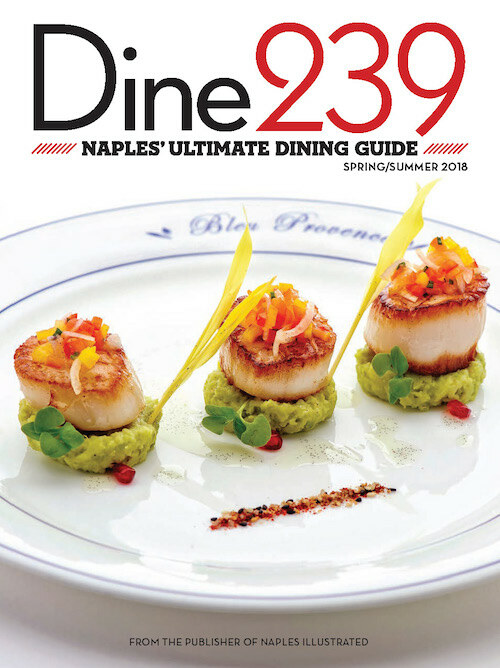 Consistently voted the “Best Public Golf Course” by the readers of Naples Daily News (2004-2010, 2012-2015), ArrowHead Golf Club fits that bill. Opening in 1997, the 18-hole championship, par 72 Gordon Lewis-designed course is dominated by water—16 lakes dot the map, with fairways snaking alongside the banks. While fees can be substantially lower than many Naples golf courses, the grounds do not lack for care—for a public course, this is one of the better-maintained 18 in Southwest Florida. With the above-mentioned water playing havoc on every hole—seriously, every hole—no. 3 and 6 offer some pretty tricky risk/reward scenarios. No. 3’s dogleg left offers those with a strong driver the opportunity to skip the layup, but you better be sure, while no. 6 gets nice and narrow on the approach, with the drink just waiting to splash to your right. Advice: grip’em and rip’em, and worry about the repercussions later.